Israel makes massive discovery of oil in the Golan Heights. Is this a prelude to the “War of Gog & Magog”? Here’s the answer, Part Two. Ezekiel 38 and 39 prophesy that Russia, along with a number of middle east nations, will attack Israel in the “latter years” in order to take a “spoil.” Now that Russia has moved into the middle east and formed a coalition with Iran and Syria, just as the Bible prophesied, I thought I would continue to share the insights of Joel Rosenberg, a Christian who specializes in the middle east. This is especially interesting because Ezekiel also prophesied in chapters 36 and 37 that Israel would be regathered after being dispersed around the world. He prophesied this 600 years before Jesus was born and it was fulfilled 2500 years later in 1948. 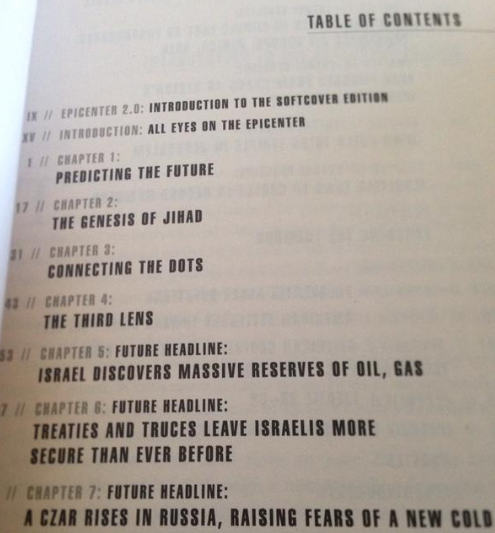 The table of contents of “Epicenter,” from 2006. (Central Israel) — It has been a dramatic month here in Israel, and we’re only eleven days in. At the moment, we’re experiencing a rash of violence, including a series of stabbings by Arab terrorists, Arab rioting in various cities, and other attacks against Jewish people. Last night, terrorists in Gaza also fired a series of rockets at southern Israel. Fortunately, the Iron Dome system shot down one of the rockets and no one was injured by the others. The Prime Minister has deployed additional police and soldiers to increase security. He has also deployed additional Iron Dome batteries in the south. Please pray for a restoration of calm. We’re not worried. Life is going on nearly as usual here. But life is never dull here, and we need the Lord to move mightily to restrain the forces of evil. Previous With Russian & Iranian forces now engaged in combat in Syria, people are asking, “What is the War of Gog & Magog?” Here’s the answer, Part One. Next Will the Biblical “War of Gog & Magog” bring about the end of Radical Islam as we have known it? Here’s the answer, Part Three.